Woohoo! I have had Nigella Express for a whole week now, thanks to a gorgeous friend of mine who ordered it for me online. It's already out in the UK, but won't make it to Australian shores until the end of the October. How could I wait? Needless to say, I absolutely love it! It's got heaps of gorgeous pictures, and really great recipes and ideas. The chapters all have different themes - e.g. breakfast, Mexican, cooking in advance, holidays, parties, workdays etc., and there is a large variety in terms of the type of recipes. I've been reading it voraciously, and cooking from it a lot. Even though I am quite busy at the moment, I've been able to try heaps of the recipes, because they are all express - easy and fast, but still delicious. These little babies were made on request of my friend who bought me the book. They're a mixture of rice bubbles, cornflakes, quick oats and sesame seeds, held together with some melted butter, chocolate and rice malt syrup. Interestingly enough, I had the rice malt syrup in my pantry, whilst I had to make a shopping trip to get the rice bubbles and cornflakes. The finished product was chewy and moreish, and a good alternative from the usual tea-time treats. Fast fries - bash a few potatoes with a rolling pin, and shallow fry in oil for 6 minutes a side, partially covered. It's one of the fastest way of making potatoes that I've tried. We had these for dinner one night to go with a marinated chicken from a semi-gourmet poultry shop and some mushrooms. I fried them in some northern European rapeseed oil, which I recently received from a friend of mine. According to the label, it has a feinem butteraroma, is low in saturated fat, has a high smoking point, and is full of those good omega-3 fats that my doctor says we're supposed to eat more of. Perfect for making you less guilty about eating fries. The fries themselves had a great contrast between soft interior, and crunchy outside, with lots of crunch coming from the irregularly bashed potatoes. Fabulous. I made the following menu when I went over to my friend Frances' house for dinner and a girly chat / catch-up / gossip session. The scallops and chickpeas were super-simple, taking only 30 minutes to put together. You chop, you fry. That's about it! My friend also made a salad of finely sliced celery, Neil Perry's Classic Mayonnaise and walnuts. (See the background of the photo below). I wasn't sure if I'd like the salad, but the combination was superb. Thank-you Frances! Yummy! The strongly flavoured chorizo went well with the milder chickpeas, which prevented the saltiness from becoming overpowering. We then made the flourless chocolate brownies; mainly because we had all the ingredients at hand. The only appropriate baking dish we had was a ceramic pie dish. It was slightly smaller than the recipe requires, and took a bit longer to bake. We added white chocolate chips to the mixture because white chocolate is awesome. It was crusty on the top, and meltingly soft within. If you let it set overnight in the fridge, you'd end up with firmly sliceable brownies. We, however, ate it straight out of the oven like a molten chocolate pudding. I had been wanting to make this pasta dish ever since I spied it in the TimesOnline.co.uk previews of Nigella Express. I absolutely love Nigella's pasta recipes and couldn't wait to try it. For this, you steep sliced chestnut mushrooms (I used the cheaper, fresher-looking Swiss browns at the market) in olive oil, lemon juice and zest, salt, pepper, and thyme. Then, you simply toss hot pasta through the mushrooms, sprinkle with parsley, and eat. It was absolutely wonderful. I will definitely be making this again! Finally, we have the meal I made for my good friends Daniel and Kevin last night. Absolutely easy peasy. We found all the ingredients at the local Safeway, did the shopping in half an hour, and got dinner ready in about 45 minutes. We had mashed potatoes to go with, made by Kevin "I'm-Irish-so-I-know-how-to-make-mashed-potatoes". I was very impressed with the stew. For something that only simmers for 25 minutes, it had a surprising depth of flavour. For dessert, we had the tarte fine aux pommes. It's just a sheet of puff pastry, pricked all over and covered with thin apple slices. (Nigel Slater has something very similar in Appetite). However, according to Kevin, this tart is "totally a Ready-Steady-Cook thing". Whatever, despite its total simplicity, it does look very fancy..
8 recipes in 7 days! Almost feels like How to Eat all over again. But wait! There's more... I currently have some pork ribs and chicken marylands marinating in the fridge, to become Maple Chicken n' Ribs tomorrow night. Stay tuned! This may be stating the obvious, but one of the things I've noticed about the healthy recipes I've been collecting lately is that the majority aren't particularly inspiring to read, and can taste a bit boring. Conversely, the gourmet recipes that I love so much tend to be expensive, difficult, and fattening. Eating exclusively healthy recipes would leave me bored (and possibly depressed), whilst eating only gourmet recipes would leave me fat and broke. As always, it is a fine balance. Whenever I find a healthy recipe that happens to be gourmet, or a gourmet recipe that happens to be healthy, I just have to try it. This recipe, from the latest issue of Diabetic Living, was part of a 'Meat-a-licious' feature. Apparently, meat recipes don't feature heavily in the magazine, in general, because lean and healthy cuts of meat are expensive, and thus not suitable for everyday family cookery. Aside from this, the recipe was easy to make, and delicious. So, you get a fillet of pork, and marinate it in balsamic vinegar, a touch of olive oil, garlic and rosemary. Then you grill it! Once it's cooked, you brush the fillet with reduced balsamic vinegar and let it rest. It is served with a mixture of vegetables - eggplant, capsicum, onion, Swiss brown mushrooms and tomatoes - which are grilled with the least amount of oil possible, and doused in a herby, vinegary dressing. The judicious use of herbs and spices is a good way of preventing healthy food from becoming disappointingly bland. No matter what Diabetic Living says, 100g of meat per person doesn't seem like enough. Portion control may be depressing, but it is important. However, with the vegetables and some multigrain bread, it felt like a complete meal. And it tasted great! Next up we have a fish recipe from Neil Perry's latest book, Good Food, which I am really enjoying at the moment. 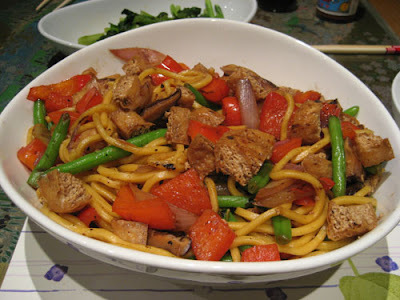 This particular recipe is healthy and tasty, and far easier than the impressive result would have you believe. Salmon searing. Stove protected by Tempura Screen purchased at Japanese grocery store. The dish consists of quickly seared salmon, served with a salsa made of cucumber, herbs, and various vinegars, some olive oil and mustard. I followed Neil's serving suggestions, and served it with boiled green beans, and (shhh!) a potato gratin. Having made a proper, sliced-potato gratin once before, this time I wanted to try something a bit easier. Bring on Nigella's gratin (Nigella Bites). There is no nervewracking measurement of cream-to-potato ratio, no finicky slicing, no worrying about the dish dimensions à la Jeffrey Steingarten. Rather, simply cut the potatoes into approximate 1 cm slices, boil with cream and milk until tender, then tip into a dish and bake in a superhot oven until brown and bubbling. The liquids become absorbed into the potato, which themselves become delightfully tender. Easy. Al fresco fabulousness. Yay for the warmer weather! The entire meal was wonderful - the acidity of the relish complementing the rich oily fish. And, incidentally, oily fish are a great source of omega-3 fatty acids, which are, I'm told, vital for brain function and heart health. I have no health-related justification for Nigella's fabulous gratin. It just tasted good. Perhaps some plain boiled potatoes, or roasted sweet potatoes would be more appropriate for healthy eating. I have been going brownie crazy over the past couple of months! I just love baking them, and most importantly, I love eating them. Very few people can say no to a brownie. Of course, brownies are definitely NOT in keeping with my new semi-healthy family eating plan. Full of chocolate, butter, eggs and sugar, brownies are some of the most decadent treats imaginable. My general brownie-coping strategy has been such. I'll bake a batch, and share some small fresh-from-the-oven slices with my family over coffee. The remainder will either be donated to the staffroom at work, or stashed in my freezer for a metaphorical rainy day. Brownies freeze very well, and freezing them prevent them from being completely devoured in one go. (Very possible). These brownies contain no butter or eggs, but rely on yogurt for moisture and leavening. I chose them from The Ultimate Brownie Book, thinking they would be low in fat and a good healthy treat. 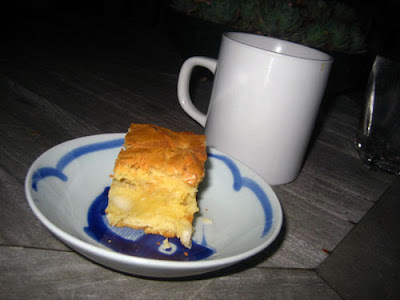 (I try to avoid those artificially "low fat" brownies from healthy magazines, which contain lite margarine, lekvar and other spooky ingredients). I was wrong. They were totally minging and feral! They were bizarrely chewy, dense, hard and very dark. I am loath to throw food out, but these had to go. These babies, also from The Ultimate Brownie Book, were a vast improvement. 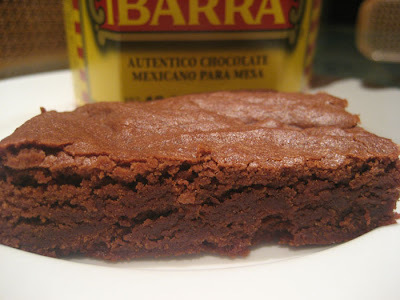 They are regular brownies, with part of the melted chocolate replaced by Ibarra brand Mexican hot chocolate. The chocolate comes in discs, and is a mixture of cocoa, sugar, spices, and cocoa nibs. I received this hot chocolate as a gift from the lovely Lisa in America. Thank-you Lisa! Luckily, they are now available at specialty shops in Australia, so I can feed my Mexican chocolate fix at any time. 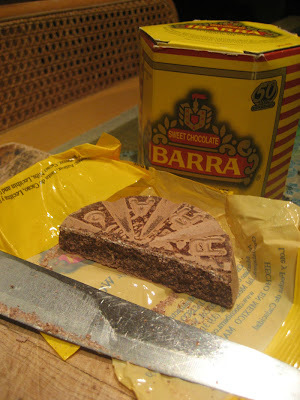 You simply melt a few rounds of Ibarra with some regular dark chocolate, and add it to the brownie mixture. It adds a wonderful spice and aroma to the finished product. These were perhaps my favourite brownies. Soft within, crunchy on the outside, delicately flavoured. Muy bueno. These brownies only containe white chocolate, and no cocoa, so I think these techinically count as blondies. But who am I to argue with Nigella? These are from her fab baking book, How to be a Domestic Goddess. The white chocolate in question is melted and folded into the batter - hardly enough! I threw in a good handful of large Lindt hexagonal white chocolate chips for that wonderful white choc-macadamia combo. (Have you ever had a white chocolate and macadamia cookie from Mrs. Fields? You should.) 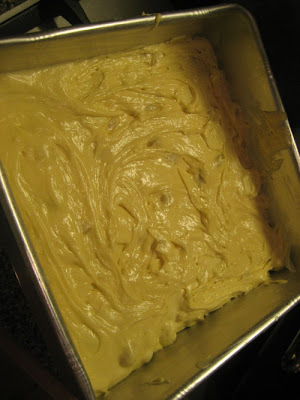 The batter is a lovely golden colour, with a warm buttery vanilla scent. I dubbed them Moon Brownies, because we ate them whilst watching the recent lunar eclipse. Moon brownies... what a time to be alive. As you can see, some of the brownies (from the centre of the pan) were very, very fudgy. If you have the patience, I'd recommend leaving the whole baked brownie to set overnight in the fridge before slicing it. Don't bake it for longer, or the edges will go dry and feral! I obviously didn't have the patience, and cut the well-cooked edge pieces away to eat straight out of the oven, before stashing the rest in the fridge. Because the inner pieces are so incredibly fudgy, they taste great frozen. Ooh yeah. Recently, I have been going lasagne crazy. 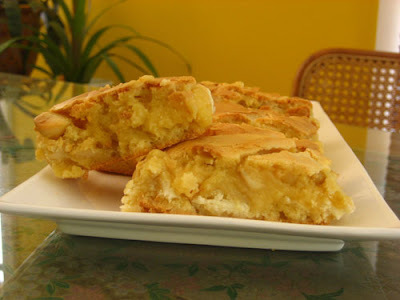 They take a little bit of time to make, but aren't difficult, and can be made in large quantities and freeze very well. They're easy to adapt, and everyone seems to love them. Fab. A lasagne is made up of 3 components: lasagne sheets, sauce and cheesy béchamel. Obviously, change quantities to suit your own cooking. I usually make a lasagne that will feed 8 people and freeze the leftovers for mid-week lunches. These can be fresh or dried. I would avoid at all costs those ridiculously overpriced lasagne sheets from gourmet fresh pasta stores - they're about 3 times the price of other types, and once they're swathed in sauce and cheese, it's hard to tell the difference between them and their cheaper counterparts. Dried pasta needs to be boiled before being layered up, which isn't difficult, but is annoying to do. I leave that choice up to you. (I've done it once, and found L'Abruzzese to be a good brand). Those instant cook hard lasagne sheets from the supermarket don't need boiling and can have satisfactory results, but can end up crispy and hard if you're not careful. To avoid this, use a lot of sauce, making sure every inch of pasta is covered. Then, let the lasagne sit for an hour or so once assembled before baking it. This will let the pasta absorb some liquid and allow it to soften. For me, the best type of lasagne to use is that soft Latina Fresh pasta, readily available at the supermarket. They come in a sealed packet, and are easy to store, don't require pre-cooking, and don't get crispy or hard. Now, as much as I love supermarket lasagne sheets (and budget cheese - see below), it is very important to use a good tomato sauce. You need a good quality, slow-simmered sauce, made with ripe tomatoes and a few choice flavourings. 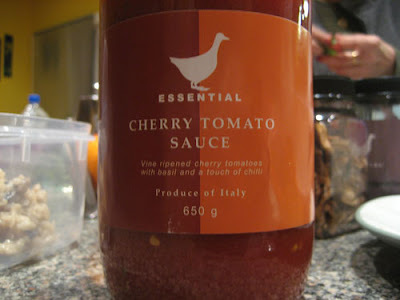 If you have an Italian nonna or neighbour who makes their own sauce, now is the time to ask for a bottle. Failing that, you will need to make your own, or go to an expensive gourmet food store to find one. Any sauce made without care or love will end up tasting cheaply metallic and sour. (I've tried Dolmio and believe me sister, it does not work). To make your own tomato sauce, simply sautée 1 finely chopped onion with a whole peeled clove of garlic, one dried chilli and a pinch of salt in a good amount of olive oil for about 10 minutes, until soft and translucent. Pour in 2 x 400g tins of chopped tomatoes (Italian, if possible), and simmer for about 15 minutes, until slightly thickened. Fish out the garlic clove and the dried chilli, add some torn up basil leaves, and your tomato sauce is ready to go. For a meat lasagne, brown some mince in a pan (I find 750g mince for an 8-person lasagne to be a good amount), before adding your sauce and letting it simmer until harmoniously combined. I usually use beef, but I guess you could use any meat - pork, beef, veal, turkey, chicken or a combo depending on what you like to eat. For a veggie lasagne, I layer the pasta and tomato sauce with all sorts of vegies - cooked chopped spinach, roasted eggplant, mushrooms, roast capsicum, whatever - and sometimes replace the cheesy béchamel (see below) with ricotta. This makes it healthier, but without béchamel, the lasagne can then tend to dryness. So, you may need to increase the amount of tomato sauce. 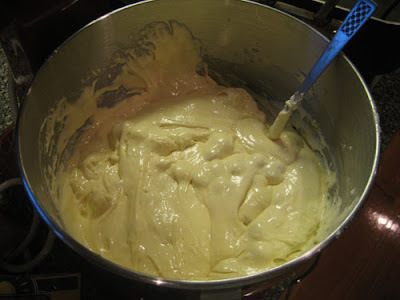 Melt 50g of butter in a saucepan, then add 2 tbs plain flour (continental or '00' flour works best - it cooks faster because it is more finely milled than regular flour), and stir over a medium-low heat for 1-2 minutes, until the flour is cooked. 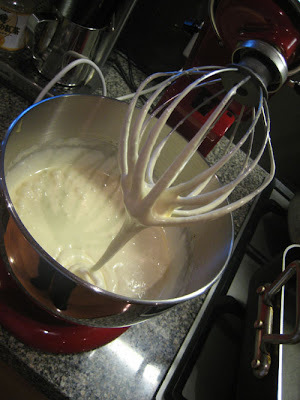 Take the pan off the heat and add 600ml milk, whisking until smooth. Return the pan to the heat and stir until thickened. If you want to add grated cheese, you could do it now. Otherwise, just sprinkle it between the layers. As for the choice of cheese, do not even think about using an expensive ball of buffalo mozzarella, or even a ball of cow's milk mozzarella. What you need is budget cheese. Really budget. Bright yellow grated mozzarella from a supermarket packet. Don't feel ashamed to use home brand cheese. Expensive deli mozzarella is undeniably delicious, but it's just not right here. Budget grated cheese gives you the requisite stringiness, is easy to deal with (doesn't need slicing) and distributes evenly throughout the whole lasagne. So, once you've sorted out your pasta, sauce and béchamel, you can just layer them up in a lightly oiled baking dish. I usually go tomato-béchamel and cheese-pasta, finishing with a layer of béchamel and a generous covering of grated mozzarella and parmesan for the top. I suppose it doesn't matter what order you go in, as long as there is enough sauce for the pasta, and you finish with béchamel and cheese. Then bake it at 180C for 45 minutes, and you are done! I am aware that lasagnes are quite high in fat; if this concerns you, here are some tips for keeping the fat content down. Some recipes I've read suggest using lite margarine as a substitute for the butter in béchamel to reduce the total saturated fat content. Feel free to do this if you like; I cannot bring myself to use super-processed margarine - have you ever melted it and smelled it? Feral!!! Using 50grams of butter between 8 servings of lasagne doesn't seem like a huge deal to me. Happy cooking everyone! A good lasagne is one of the most satisfying ways to feed your family. Last week, I made myself a special little lunch as a treat for work. I also made a fab little tomato salad, including macerated red onions to go with. 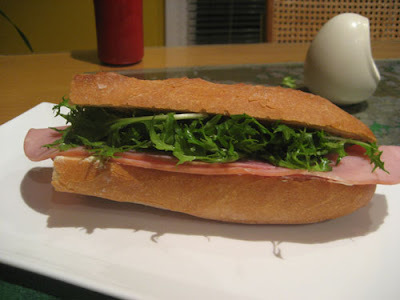 I made both baguette and salad the night before work, and was greatly looking forward to it. This was until my boss suddenly decided that the staff room fridge needed to be cleared out (even though it wasn't the fridge-clearing-out-day), and promptly threw everything unlabelled into the bin. Ahem! Luckily my baguette was salvagable - it had been double wrapped and paper bagged, and had only been in the bin for the merest second before I pulled it out. It was still good! Phew. My tomato salad, however, had been emptied into the bin and could not be saved. It was a sad day. And that is why, kiddies, you always label your food!